Theaim of this study was to determine the tongue-coating status (using modern index system), the degree of gingival hyperplasia, to register the observed oral lesions in 30 patients with replaced renal function (hemodialysis and renal transplanted). Key words: patients with replaced renal function, oral manifestation, tongue coating scores. 8. De la Rosa Garcia, E. et al. Oral mucosa symptoms, signs and lesions, in end stage renal disease and non end - stage renal disease diabetic patients. Med Oral Patol Oral Cir Bucal., 2006 Non 1; 11 (6): E 467–73, Synder, S., B. Pendrgraph. Detection and evaluation of chronic kidney disease. Am Fam Physican, 2005 Nov 1; 72 (9): 1723-32. 13. Ertugrul, F., C. Elbek-Cubukcu, E. Sabah, S. Mir. The oral health status of children undergoing hemodialisis treatment. Turk J Pediat, 2003: 45; 108–113. 16. Gera, I., T. Keglevich. A case history of a kidney transplant patient with ciclosporin - induced gingival overgrowth combined with chronic periodontitis. Perio, 2007; 12: 287-293. 18. Jaffe, E. C., G. J. Roberts, C. Chantler, J. E. Carter. Dental findings in chronic renal failure. Br Dent J, 1986; 160: 18-20. 19. Kellett, M. Oral white plaques in uraemic patients. B Dent J, 1983; 154: 366. 21. Kojima, K. Clinical studies on the coated tongue. Japanese J Oral Maxilofac Sur, 31, 1985: 1659-1676. 22. Long, R., L. Hlousek, J. Doyle. Oral manifestations of systemic diseases. Dermatol Clin, 1998, 65: 309-315. 30. Ross WF, P. L. Salisbury. Uremic stomatitis associated with undiagnosed renal failure. Gen Dent, 1994; 9/10: 410–412. 31. Seymour RA, J. M. Thomason, A. Nolan. Oral lesions in organ transplant patients. J Oral Path Oral Med, 1997; 26: 297–304. 32. Seymour R, D.J. Jacobs. Cyclosporin A and the gingival tissues. 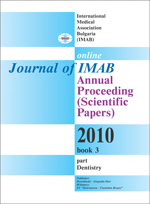 Journal of clinical periodontology, 1992; 19: 1–11. 35. Taylor BA. Management of drug - induced gingival enlargement. Australien Prescriber, 2003, vol.26,1. 37. Wu J, Zhang Y, Bai J. Tongue area extraction in tongue diagnosis of traditional chinese medicine. Conf Proc IEEE Eng Med Biol Soc, 5, 2005: 4955–4957.